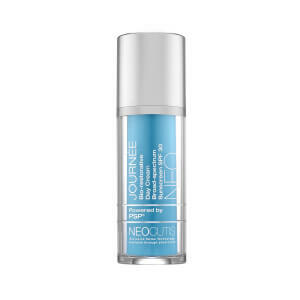 NeoCutis JOURNEE Bio-Restorative Day Cream with PSP is a potent anti-aging day cream with PSP, antioxidants, Hyaluronic Acid and UVA/UVB protection to rejuvenate, protect and hydrate skin. Formulated with PSP, the most complete protein blend of Human Growth Factors, Cytokines and Interleukins available to rejuvenate and soothe skin. Octinoxate 7.5%, Zinc Oxide 7.3%, Water, Caprylic/Capric Triglyceride, Hydrogenated C6-14 Olefin Polymers, Hexyldecanol, Glycerin, Glyceryl Stearate, PEG-100 Stearate, Potassium Cetyl Phosphate, Hydrogenated Palm Glycerides, Microcrystalline Cellulose, Camelia Sinensis Extract, Silica, Cutaneous Lysate, Sodium Ascorbyl Phosphate, Tocopheryl Acetate, Squalane, Hydroxyethyl Acrylate/Sodium Acryloyldimethyl Taurate Copolymer, Polyhydroxystearic Acid, Steareth-21, Melanin, Cetearyl Alcohol, Sodium Hyaluronate, Polysorbate 60, Triethoxycaprylsilane, Disodium EDTA, Xanthan Gum, Styrene/Acrylates Copolymer, Phenoxyethanol, Methylparaben, Ethylparaben, Propylparaben. I have been using Journee Day Cream for a year and my skin looks and feels amazing. I literally get compliments on how fresh and dewy my skins looks daily. I use the day cream as my final morning step/foundation. It leaves my skin with a perfect glow that last throughout the day, plus I know I am protecting it from sun exposure without using another product. The Day Cream is costly, but I feel I am getting a great product for the cost and it does improve my skin texture and tone.